Jeff "The bomb got dropped last night was weird as f**k. I started pouring gasoline on it! I needed this to blow up!" 9:50am All of the house guests are still sleeping except for Vanessa. At 10am big brother wakes up the house guests. When the feeds return – Jason and Johnny Mac are lowering the awnings on one side of the backyard and Steve & Becky do the other side. Jason says if only we had manners like you big brother. Jason tells Johnny that Jace was trying to flip the house last night. I won’t even spoil the surprise for you. Johnny says he asked me a few times. Jason says I don’t think we’re a cast that are afraid to call someone out but in week 1 …yeah! In the storage room – Clay tells Austin that Jace is helping himself. Austin says oh.. really?! Clay says I don’t want someone to see us and for it to look sketchy. Clay tells him that Jeff helped me out. He’s a good guy. Clay tells Austin that Audrey is f**king us. Austin says no way?! Clay says I’ll fill you in later. Austin asks shes with us right? Clay says not any more. Austin asks man to man is this for real? Clay says yeah and shakes Austin’s hand. Liz joins them. Austin tells her that Clay is turning on Audrey too now. Liz says yes!! 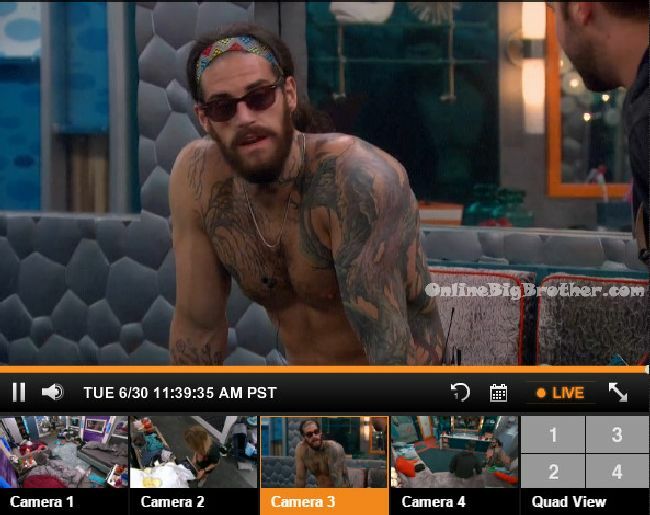 Austin says He said she is f**King him up now too. I asked him really? Man to man. And he shook on it. I played dumb to it. He said he is going to try and get Vanessa and Shelli to flip on her too. Sit back and let it happen. It will be Shelli, Vanessa, Clay and Me get her out and you’re coming in. 10:35am In the bathroom – Austin talks to Jeff you tell me because I am on the fence about it. Jeff says just go with the house. It bought him (Jace) a bit of freedom … I kind of threw him a bone. You’ll know more about it later. Jeff says the bomb that got dropped last night was weird as f**k. I kept thinking it was like America’s Player / Saboteur sh*t. Austin asks that early? Jeff says everyone is on the same page. Jeff says you play with fire you get burned. We’re just letting her (Audrey) know that Jace is acting all crazy. Jeff says you have to go with the house. Jeff says there were too many promises made and unfortunately she (Audrey) should be in his (Jace) place. This pretty much secures your and Liz’s spot. Its good for you guys .. just go with the house. Jeff says anything that’s been said on either of our side is dropped as of yesterday. If there is anything you can ask Jace is that we bonded a bit last night. Hopefully that buys a bit more trust with me. Jace now has a fair campaign. He was able to talk with everyone about why he is up on the block. 10:45am – 11am In the kitchen – Jeff tells Liz .. basically that coniving a$$hole was trying to flip things on me so I had to make some moves. I talked to Austin. This is going to look good for you guys. You don’t have to worry about a f**king thing. Just don’t say a word to her (Audrey) at ALL! It got so weird last night. No one was going to tell Clay or Shelli but Clay and I are really tight.. and some people were starting to question him. Clay slipped and told Shelli …so I had to flip it and expose the whole thing or keep lying. Jeff says that Jace went kind of CRAZY last night! He started throwing everyone under the bus. If anything comes out of it .. it will get blamed on the guy that is getting booted out. He is going to be campaigning .. but you guys are going to have to vote with the house. Just smile and nod your head. This just gives him the opportunity to kind of explain some things. Jeff leaves and Austin tells Liz we just need to not treat Audrey any different just in case she wins HOH so we don’t get f**ked. Jeff comes back and says that Jace went crazy and started cornering people last night. Austin asks weird sh*t about the game or life. Jeff says both. Jeff says I started pouring gasoline on it because I needed this to blow up! James joins them. Jeff tells him so I woke up and they (Austin and Liz) already knew. Jeff turns to Liz and asks so you guys woke up and already knew or find out. Liz says yeah you guys were up super late. But yeah I don’t know. James leaves. Jeff then whispers to Liz to lay low and he’ll get her in. Jeff says my position has moved up kind of high because of the stuff that happened last night. The only thing is I will have to separate from Clay. Jeff talks about how Jace has to still go because of promises made. Jeff says if it was anyone else on the block we would just flip on the other person. Liz says I know, I know. Liz asks should I talk to anyone like Becky today or just lay low. Jeff says put it this way Becky isn’t a part of the house. 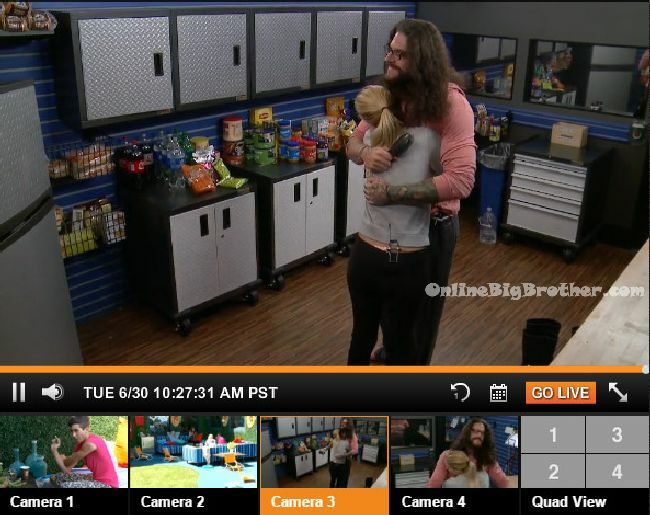 Big Brother 17 Live Feeds: 1 WEEK FREE TRIAL! 11:10am Backyard – Johnny Mac asks what do you think we should do vote him out? Vanessa says I don’t think we have any other choice. He’s a competitive beast. He hasn’t even talked to me. Johnny says he asked me to vote for him.. I said I can’t flip the house I don’t even know how to do that Vanessa says I have a fast forward. I’m not even in the game right now. I feel like deals were made and we’re not a part of them. Johnny says I think those are deals that we don’t want to be a part of because I don’t think they are working out too well. Vanessa says there are people I don’t trust and you are not one of them. If you want I will make a deal with you that if I win / you win … I will not put you up. Johnny says deal! Liz joins them and the conversation ends. 11:20am Jeff says so I’m pretty sure you guys know the house blew up last night! Vanessa asks really? Jeff says yeah he went nuts! Vanessa asks like on who? Jeff says everyone… you’ll get your turn. I’m talking about people getting pushed into room and stuff. Johnny mac asks did the bible get involved. Jeff says Not with me but some weird sh*t happened. Jeff says some person started a rumor about me and I had to squash it. Jeff says I’m sure you guys know its unanimous that Jace is going home. It’s unfortunate but he is going home. During his campaigning he did a couple of good things for the house. He exposed somethings that some people had only talked about in corners but were to scared to come out with it. This person thats been causing a lot of problems got exposed. They’re game got blown up. Basically if you guys go with the house .. then you’ve bought yourself another week. Vanessa says I was planning to any ways. Everyone leaves but Vanessa and Johnny. He says that if I were to guess it would be Audrey they’re talking about. I don’t want him to confirm anything .. because I think its better for us to not know. Vanessa says its better to have information to make decisions. Vanessa heads inside to find out what’s going on. Johnny says he’s going to eat breakfast. In the bathroom – James tells Liz he feels really bad that someone is up there (Jace) that shouldn’t be up there. Someone else should be in his place. I feel like a puppet that got played. James says don’t worry I’ll make sure you don’t go down with the ship. Big Brother calls James to the HOH room. 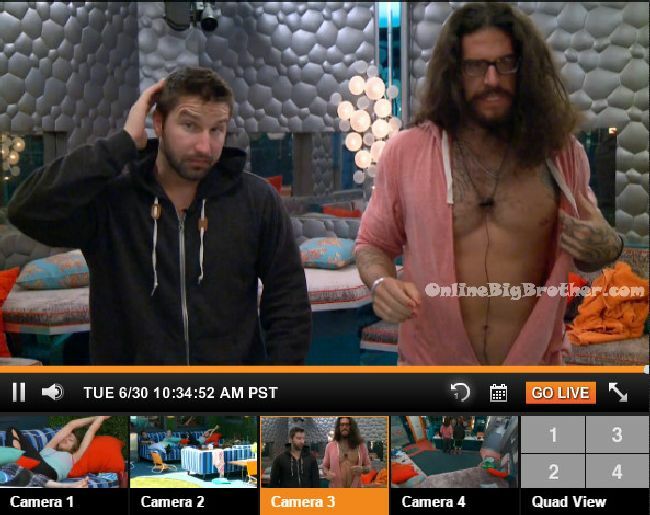 11:40am In the bathroom – Jeff and Austin are talking. Jeff says that Liz is f**king hot! She is definitely the hottest girl here. She’s a smoke show! Jeff says you missed the nip slip the other day with Becky. Austin asks where did this happen? Jeff says by the pool. But Meg ruined it with some girl code sh*t. James then started getting creepy. Austin says James said she could be his weekend girl. I don’t like it when guys talk down to girls. Hey Jeff, loose lips sink ships. Stop talking, or you’ll be the next target instead of Audrey. Vote with the house. Wonder where I have heard that before. Sigh. “I have no choice…” That’s the part I don’t get. They fall in to that so freaking easily it’s annoying! People who want Audrey out will regret it.Without her,the feeds will be boring. I’m not too concerned Audrey is going anywhere any time soon. Jeff,on the other hand, needs to get a grip. He only revealed what every one already knew,except for maybe Clay (since the extent of his game play has been planning Day’s demise and following Audrey’s marching orders). A few words of advice to Jeff: Pride goeth before a fall! I would not be surprised if production helps Audrey win HOH this week, so Jeff had better calm down. There is enough crazy in the house to last a long time. Sithe Lord Aud needs to go. Her Mind Tricks aren’t working anymore. I disagree, i think there is still potential for drama even if Audrey leaves, there are plenty of strong personalities in the house besides her. Wow… Jeff is so desperate to be a “cool kid”… obnoxious idiot! lol They picked the wrong couple from Amazing Race to come this show… They should have picked Blair and Hayley! Hayley would’ve been the first one voted out,hands down. She was obnoxious. Hey David, Thanks for the suggestion I’m not sure I have the time to add power rankings. Producing the detailed spoilers takes pretty much all our time and energy. I’ll give it some thought though. Not overstepping at all I appreciate the recommendation. YESS! I’ve been wanting a Johnny Mac, Vanessa, and Steve alliance forever. I’m happy I might be getting 2/3! :) Fingers crossed that it lasts! Its on youtube.. just search bb17 liz/Julia. I however do not think it proves anything. She was basically speaking as if she were Austin “you wouldn’t go talk to liz then go talk to jeff”. I see someone else is using my name…. I did not make this comment. Can someone give me some insight as to whether or not there were conversations including Liz ( actually her twin? ) where Liz referenced “Liz” like she was talking about herself in third person. CarterMatt’s site stated this had happened a couple times already. Liz’s twin obviously isn’t doing a very good job since I’m pretty sure that’s the number one rule of twin-switching. There is something about Jeff that is so irritating & annoying. to be on BB17 is beyond me!! Now I know that JohnnyMac is actually smart about this game and laying low not just floating. Jeff is so damn annoying. It would be fun if audrey won hoh and got revenge on him for turning the house against her. Is she’s gonna be evicted so soon, i’m gonna miss all the drama she causes. I know I am in a minority here, but I want the house to flip and save Jace!! Whereas Jackie is merely a vote, Jace is entertaining, willing to get all up in people’s faces and call them out, he will do the dirty work AND he is a vote! I think if folks actually sat down and thought this out strategically, they would see the benefits of keeping Jace around versus Jackie, especially with Audrey still in the picture. Speaking of which, IF Audrey is the target next week (barring an HOH win), she absolutely needs to be backdoored….nominating her off the bat gives her two potential chances to save herself. Clay mentioned “the eight” in front of Jace last night. I hope Jace caught that and uses it to join the other side of the house together. backdoor on Audrey just isn’t going to work unless Jeff shuts up. He has no reason to be talking about next week, and is going to sink the entire ship. well, that and it gives production a way to indirectly tell Audrey that a former amazing race contestant may or may not want to backdoor her the next week. jeff is playing just as hard and just as blind as Audrey. its kind of disappointing because I love people who play the game, but this is not how you play and win. if you want to play the rat role(andy), you have to do it well and wait out a few weeks to see actual relationships develop. its like Zach and cody last year. if you approach cody week 1 or 2 about Zach, WTF? if you wait until week 4 or 5, all of a sudden he is on board. the relationships fall apart and they can become stronger, jeff is acting like its all set in stone this particular week. just shortsighted. I just started keeping up with the updates and BBAD the past couple of days, but would I be wrong to think that Johnny Mac, Meg, and Vanessa are in the best position right now in the house? I feel like everyone generally likes them and views them as harmless, which is the perfect recipe to get far in the game. Also Sorry Butter’s Mom, when i posted my comment it put me as Butters Mom and I forgot to change.. I reposted under my own name. lol… I just read that and commented on it before I saw this post. I didnt know that could happen. early game deals only work when you throw out the petty BS. I hated the bomb squad, but the reason they worked was because outside the decision to drop matt(understandable), they stayed together, left the petty BS on the side and stayed strong. now there is a new alliance every 15 minutes. I love Chilltown, but my gosh they created a monster that is only getting bigger and more annoying. I think a new rule needs to be no alliance names until the alliance lasts more than a week and actually accomplishes something. If Jeff keeps it up he could find himself in trouble. Sure they can’t get Jeff out this week but voting out Jackie would hurt his game and the rest would be safe next week as Jace, Jeff and Audrey would be the potential targets. Jeff is a little know it all flibbertygibbit who thinks he’s in the in crowd and needs to run around making sure everyone knows it (even the real in crowd). He’ll burn everyone out with his self importance and misogynist ways around the gals. James is acting so creepy with the girls. I wanted to give Jeff a chance but he gets on my last nerve..does he have a crush on Clay..I like Johnny Austin and Jason a lot better! Wow I can’t stand the way Jeff and James talk about the women..James is really getting creepy.I like Austin John and Jason.